Description: Slender, tufted perennial with very short rhizome. Culms rigid, erect, terete or slightly compressed, glabrous, smooth, 30–100 cm high, 0.7–2 mm diam. Leaves terete above, channelled near base, often more compressed than culms and shorter, to 1 mm diam., or reduced; sheath straw-coloured to reddish, not viscid, dull. Inflorescence linear to fan-shaped in outline, erect to spreading, rachis straight or flexuous (especially on longer branches), 1–12 cm long, 0.5–8 cm diam. ; involucral bract shorter than inflorescence. Spikelets few to numerous, 6–10 mm long. 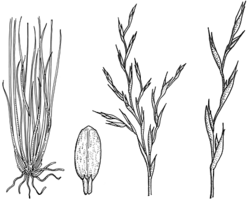 Glumes 4–6, pale red-brown to grey-brown; 2 or 3 lowest empty, shorter than fertile glumes, acute, mucronate, glabrous; fertile 7–9 mm long, long-acute, scaberulous. Scales 5 or 6, a quarter to a third the length of nut, whitish to yellowish. Anthers 2.5–4.3 mm long, excluding appendage 0.8–1.3 mm long. Nut narrow-obovoid to ovoid, 2.8–4.0 mm long, 1.2–1.8 mm diam., grey-green to red-brown, smooth, shining. Distribution and occurrence: Grows in heath, woodland and forest on sandy soils in coastal areas; south from Evans Head, and on the eastern edge of the tablelands south from Point Lookout area. L. flexuosum had been distinguished on the basis of more flexuous rachis and on reddish coloration of leaf sheaths. However, the variation seen in N.S.W. in degree of flexing of rachis, and the variation everywhere in colour of leaf sheaths (usually yellowish but reddish often and both colours can be found in the same population), do not seem to correlate. Since all other characters vary little, the two species are here united.